Note: I am aware that the Tor Project recommends against this and I want to do it anyway. 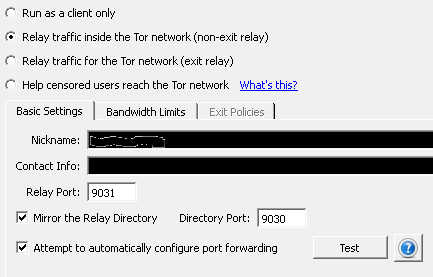 I've downloaded the Tor Relay Bundle and everything seems to be working fine. I can see myself as a relay on Atlas. However, I can't seem to configure Google Chrome to use Tor. The web page at https://www.google.com/ might be temporarily down or it may have moved permanently to a new web address. Warning: The Tor Project advises against configuring systems manually like this. The safe method is the Tor Browser Bundle, you can not expect Chrome to keep you anonymous just like this. Another option might be to tunnel an entire (virtual) machine's traffic through Tor (like Tails OS does I think) but that is out of scope here. That error message is useful. It means the port is right because Tor is receiving data from Chrome, but Tor tries to interpret it as SOCKS data and is unable to recognize it (67 is not an existing version of SOCKS). This means Chrome is using the wrong protocol to talk to Tor, most likely (like the error says) Chrome is talking like it would to an HTTP proxy. But Tor is not an HTTP proxy, it's a SOCKS proxy. chrome.exe --proxy-server="socks5://localhost:9050" --host-resolver-rules="MAP * 0.0.0.0 , EXCLUDE localhost"
You can find this path\to\chrome by rightclicking on a shortcut to Chrome and then choosing either properties or open file location. Both will show the full path where the file, chrome.exe I assume, is contained. In Linux you probably would not need to use the cd command and the rest would likely be the same. In Mac OS X I don't know (please edit this answer if you know). And that should be it.... I hope this helps ! Run tor.exe --HTTPTunnelPort 8118 and set 127.0.0.1:8118 as proxy. I'm running a Tor Relay on my Raspberry Pi, is it safe to use the Raspberry Pi as a proxy for all the machines on the LAN? How to configure Tor browser without Vidalia on Mac OS X?